As well as the totally unhelpful pot of crap that is the Microsoft help site. First, install the Logitech SetPoint Software and Unifying Software, which you can download here. Second, add the K400r and any other hardware you need (I use a wireless mouse in conjunction with the keyboard) via the unifying software. Make any changes you feel necessary with the SetPoint software. Third, disable Edge Swipe in Win 10 by using Group Policy setting or registry edit as described here. Optional step: Install the Logitech Smooth Scrolling extension for Chrome. Fourth, uninstall the Logitech SetPoint Software ONLY (leave the Unifying Software). You need to start writing in English. No time, I don’t have genius bar support. I wish this worked for me, but it didn’t. Does anyone know of a similar keyboard that doesn’t have this problem, mine is pretty old at this point. This will probably be the definitive answer everyone has been looking for. I found out that if you press fn + right mouse button, the gestures on the touchpad are disabled and the annoying task switcher no longer kicks in. Do note if you turn off the keyboard the setting will reset you will have to press the above key combination again. THANK YOU SO MUCH!!! This is the only thing that worked for me! I can’t believe how long it’s taken to find this fix, it’s been bothering me for months. Thank you so much. [FN]-[Right click] works like a charm. Thank you both SO much! I’ve been searching for a solution for MONTHS! I love this keyboard, but the Edge Gestures were absolutely killing me! Justin, your solution works, but it doesn’t maintain the fact that I’d like my F-keys swapped (I accidentally hit them all the time and open options, pause music, switch screens, etc.). And then KolMaxx, where did you get that info?!?!? It works perfectly! I tried looking online and found NOTHING, is Fn + Right Click some sort of shortcut disable? Please tell me how you found this out! With your method I can keep all my SetPoint settings and not have to worry about the stupid Edge Gestures! THANK YOU BOTH SO MUCH! I was just working on a solution of putting a thin strip of electrical tape on the side of the keyboard to not have it read at the very edge but you saved me from my janky fix. Honestly, I was just exasperated with the keyboard I started fiddling around with the Fn key in combination with the other buttons. I only noticed after a few tries that that combination actually worked. 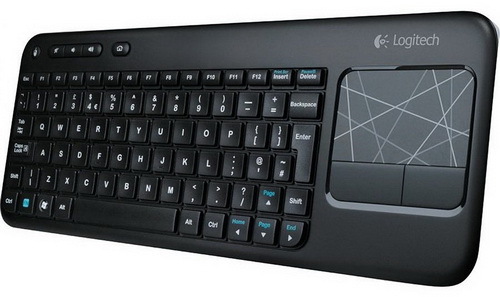 I spent a large portion of a day trying to find any other reference to this, but the entirety of the internet yields only one other: a comment on the Australia PC Part Picker site, located here: https://au.pcpartpicker.com/product/9BK7YJ/logitech-keyboard-920003070 | The commenter indicates that Fn + Right Click cancels the edge gestures, and Fn + Left Click turns off touch pad click (doesn’t work for me, but I have it turned off with the Logitech Program) and I read on another comment on the deptsh of the internet that it may be a sort of universal Logitech Shortcut. Not sure where he found that out, as I can’t find supporting documentation anywhere, but either way, I’m thrilled. This really is my favorite keyboard (for general use, anyway): it has Print Scr, Insert, separate click buttons, full sized arrow keys, and a generally “normal” layout. And it’s one of the cheapest ones! Since your post, I’ve purchased 2 more; I don’t see any keyboard ever besting this one, unless they made the exact same keyboard except with a backlight. Thanks again! Thank you for this! I’ve been trying to do this for a long time and these instructions were the only ones that helped me. For some reason, all past time I’ve installed SetPoint software, I did not see the keyboard/mouse settings in it (maybe because I didn’t install Unifying Software in addition and/or because this time I unpaired and re-paired the keyboard). So basically your first two steps were all I needed to do, because this time SetPoint did show the keyboard & mouse configs and I was able to disable the gestures there – as well as tweak a bunch of other settings I’ve wanted to change for a long time but didn’t know how. The instructions didn’t work, BUT I did get it to work by opening the Setpoint software and selecting the touchpad. Then I was able to uncheck all the “Edge” gestures from there.